SIZE 13 13/16" x 21 7/8"
Sly & the Family Stone was the main attraction at this Winterland concert, allowing Bill Graham to add lesser known groups to take advantage of the band's drawing power. 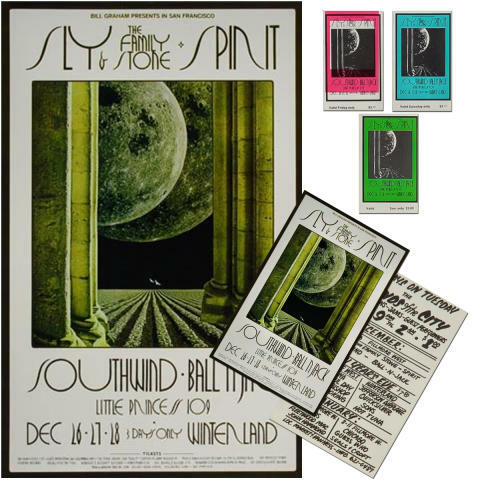 Southwind, an Oklahoma-based country rock band, and Ball and Jack, a short-lived, Jazz-Rock sextet that garnered a small following through the early 70's, played the headliner's following. The Poster/Handbill/Ticket Bundle contains a 1st printing poster, 1st printing handbill, and a set of 3 tickets.